I’ve been a harsh critic of Dropbox in the past – mostly because I feel they lack maturity – both as a company and as a product – and this lack of maturity is a real risk for enterprise customers using their product. It seems Dropbox has been listening to the criticism that myself and others have been making for today they are introducing a slew of changes to their team edition that should allay many of the concerns that corporate IT have (many, but not all). Just a reminder, for those who have been living under a rock, Dropbox is pervasive in the consumer scene – with well over 100 million users. This usage has transferred into enterprise with Dropbox reporting that 95% of F500 companies have some use of the product linked to their organization’s email addresses. I spent some time talking with Tido Carriero, engineering lead for Dropbox for Teams product – the fact that I was even approached for a briefing indicates to me a growing understanding within Dropbox of the way enterprise IT works and the fact that engaging with influencers and analysts is an important part of the process. See member details, including per-user storage usage, recent activity, web sessions, linked devices and third party applications. View team activity, such as member log-ins and team invitations, and easily generate downloadable reports. Dropbox hasn’t, as yet, introduced any file level activity logging within the admin dashboard – Carriero told me that this is something they are looking at, another thing they’re apparently thinking deeply about is encryption. Dropbox encrypts on the fly but as yet hasn’t got a consistent answer to organizations that want their data to be encrypted at all points along the chain, and want encryption keys to not be accessible to Dropbox itself. In something of a surprise move, and one that indicates just how serious Dropbox is about placating IT concerns, they have introduced the ability for IT to disallow file sharing outside of the organization, along with the ability for employees to share files from outside the organization. This kind of fluid file sharing is the essence of what Dropbox is about, and also the reason most enterprises sweat every time Dropbox gets mentioned – the inclusion of this lockdown ability is a big deal and one which Dropbox would have debated internally. It is being introduced with a more permissive model – IT admins will have to manually disallow these more fluid sharing models. I also raised the concern of employees who have signed up to Dropbox with business email addresses but for personal use – this new functionality could potentially break Dropbox for these people. 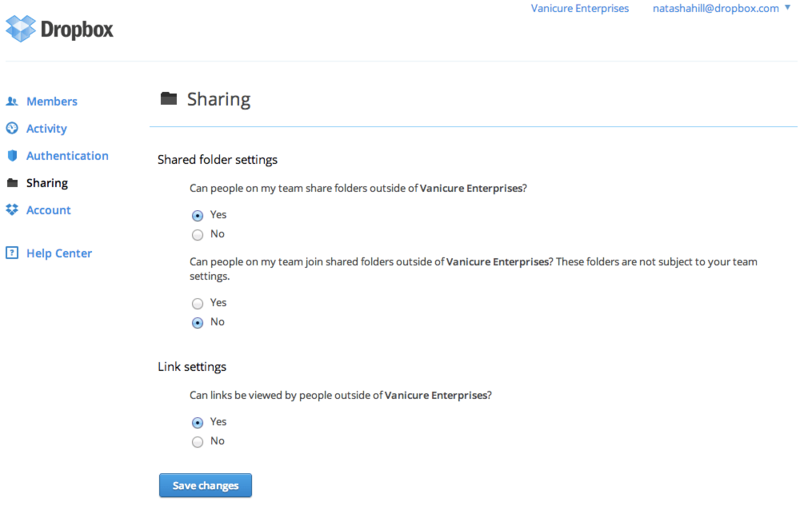 I was told that the changes will only apply to folders shared going forwards – ie employees already sharing folders from outside the organization will not be kicked out, and that this permissive model sees Dropbox give lightweight warnings when files are being shared outside of the organization (akin to those that Google Docs users receive). This release is a big deal – at last Dropbox is putting some of the monstrous quantities of cash it has raised to good use and is really thinking hard about what it means to be an enterprise company. With that refocus however comes difficulties, and the obvious disconnect between bottom up and top down approaches to IT. Dropbox has always been about bottom up end users adoption, they now have to start thinking a top down story. Still, it’s a similar struggle to that faced by companies such as Yammer and Box and both of those managed to navigate the torturous path between the two worlds – let’s see if Dropbox can do similarly.